Mike Harris has covered sports with a heavy concentration on motor sports for 43 years, including the past 40 with The Associated Press. After growing up in Madison, Wis., Harris graduated from the University of Wisconsin in Jan. 1967 and began his full-time journalism career later that year with The Rockford (Ill.) Morning Star and Register-Republic. After 18 months covering a variety of news and sports for the Rockford paper, Harris took a job as a newsman with AP in Chicago. After a brief apprenticeship on the news desk in Chicago, Harris spent five years as Indiana Sports Editor, five years as a sports writer in the Cleveland bureau and became the AP’s Motorsports Writer in January, 1980. Over the next 30 years, he covered every aspect of motorsports, as well as reporting from the LA and Seoul Olympics and the 1980 Super Bowl. Last May’s Indianapolis 500 was the 40th of his career. Along the way, Harris twice won the Frank Blunk Award, as well as the Henry McLemore Award and the Ray Marquette Award, among others. His coverage of the death of Dale Earnhardt in 2001 was honored as AP’s Story of the Year. 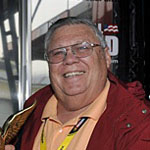 After retiring from AP in July 2009, Harris decided to continue his career writing for RacinToday.com. He lives in Wake Forest, N.C., with Judy, his wife of 41 years. They have two grown children, Tory Harris and Lanni Isenberg. Editor’s Note: RacinToday has two reporters – Mike Harris and Jonathan Ingram, both veterans of the event – on site at the Rolex 24. They will periodically file updates, notes and features during the race and wrap the event up afterward. Chip Ganassi’s passion for auto racing started early. When he was 5 years old, Ganassi’s father went to Indianapolis to take part in an equipment auction and took in the 1963 Indy 500 while he was there. The elder Ganassi came home with an 8 millimeter film of the race. Concord, N.C. – Michael Waltrip plans to slow down some, but only on the race track. The owner of Michael Waltrip Racing, which will field NASCAR Sprint Cup cars for David Reutimann and team newcomer Martin Truex Jr. in 2010, says he is bringing his Cup career to a halt. Concord, N.C. – It seems there is some kind of populist movement under way in NASCAR. Over the years, the wheels of NASCAR’s hierarchy have tended to turn a lot slower than the wheels on its race cars. Concord, N.C. – If Dale Earnhardt Jr. fails to get back into the top echelon of NASCAR Sprint Cup competitors in the 2010 season, it won’t be for lack of effort. Editor’s note: The annual NASCAR Media Tour hosted by Charlotte Motor Speedway is being held this week. RacinToday has a trio of writers on the Tour and will be reporting daily with opinions, features, news and notes. Concord, N.C. – Not surprisingly, one recurring question at the annual NASCAR Media Tour sponsored by Charlotte Motor Speedway is: How do you think Danica Patrick will do in stock cars?